Buy us a 1UP on ko-fi! InGameUK an ethical, sustainable community with purpose and soul. InGameUK is on a mission to spread fun, encourage creativity and play, while fostering an inclusive community around the passions we love! We collect. We play. We LOVE to share our passion through video projects that excite and unify people around our nostalgia for RETRO! Or generally anything a little quirky and unusual! Creativity is the soul of what we do and would love your support to help us keep doing what we love! We attract new players to the GAME! Our ambition is to foster an inclusive community that celebrates creativity and the hobbies we love. By supporting us on Pateon or Ko-fi you directly support the production of new video content, funding equipment and time to create inspiring videos. 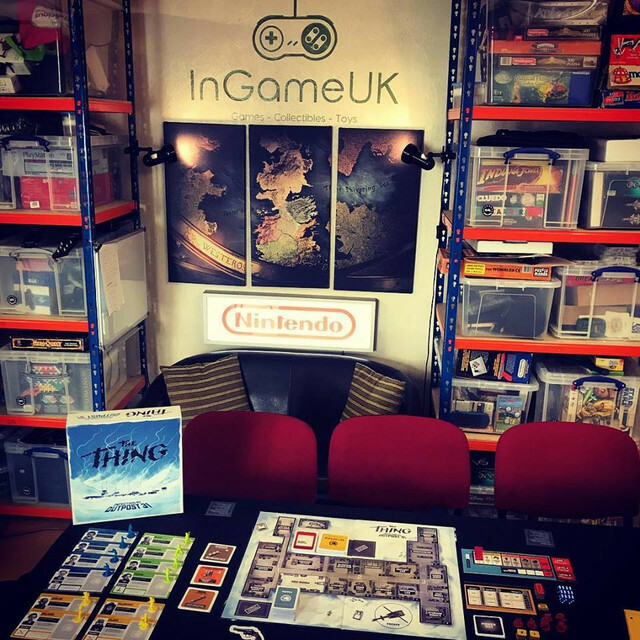 Your financial support also helps us host FREE Themed Board Game Experiences at The InGameUK Retro Gaming Bunker and across Plymouth / Devon in our soon to be mobile experience! Videos. Photos and More Stories. Events! Either PopUp across Plymouth and Devon or Themed Events at InGameUK Bunker. Connect. Share and Innovate. Develop new ideas to connect people with our ethos and lifestyle. Attending Expos and Supporting Local Board Game Communities. Support other Patreon campaigns who share in our ethos! Join our exclusive COMMUNITY GROUPS! Access exclusive free CONTENT & REWARDS! We believe our hobbies can change the lives of many people, through our passion and excitement. InGameUK is a supportive community and network to do good. To us it is a lifestyle and we want you to be part of it. InGameUK was started in 2017 by Andrew Jinman, a unique and new offering, aiming to promote and encourage, creativity, play and community! Yes we buy and sell loads of cool stuff but that’s not what we about. We love to Share and most of all Play! Andrew is an experienced videographer and photographer, with many years experience. He loves to share stories and promote the passion locked away within the community through mini viral video projects. Aside from moving meeples around, Andrew loves Technology and investing in new ideas to communicate and engage people from all over the world, for him its about creating stories that resinate and inspire peoples imaginations. Whether its playing a Computer Game or being totally immersed in the latest Board Game or even using your imagination when playing with Toys! For us, everything and anything that uses creativity or Imagination is totally #InGameUK!! Come and join us and share your experiences! What was your favourite toy or game as a kid? We’d love to know! Please check us out on Instagram or all the other usual places for the latest updates and some really cool content! Or Contact us Now! With your support we can create some really cool content, from viral videos through to documenting the events we attend. Writing cracking blog posts, to stunning photos and awesome video content. We’ve already got the ideas, we just need a little financial support to make our aspirations a reality. With your help, anything is possible! Join Patreon for some great discounts and exclusives or throw us a “1up” (£3) on Ko-fi! Help support free independent content with InGameUK. Donate directly with PayPal and keep us creating great content! EXTRA LIFE NEEDED! Buy InGameUK a spare 1UP for £3 on Ko-fi. We're a gold member and proud to support this great network of content creators!